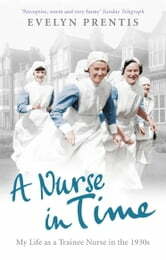 Desperate circumstances were something Evelyn Prentis had to get very used to when she began her life as a nurse. It was in 1934 that Evelyn left home for the first time to enrol as a trainee at a busy Nottingham hospital in the hope of £25 a year. A Nurse in Time is her affectionate and funny account of those days of dedication and hardship, when never-ending nightshifts, strict Sisters and permanent hunger ruled life, and joy was to be found in a late-night pass and a packet of Woodbines.